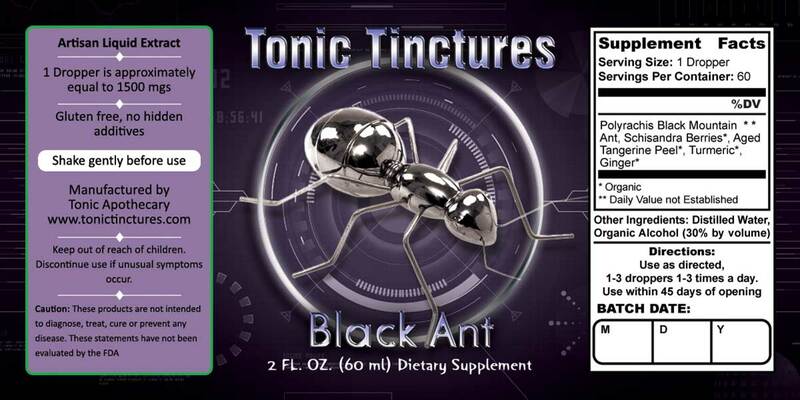 Dose is 1425mgs edible Polyrachis black ant extract liquid per 1ml dropper - supplement size is 2oz (60ml) per bottle. I can't take this before bed . . . this is Superman stuff ! I bought this and the ginseng, which I really like, but this ant tincture was like black plasma. Totally crazy stuff. It reminded me of being something like electronics lubricant. It seems to keep my nerves cool and chill and combos with the ginseng really well. Black polyrachis ant is equal in yin and yang so it is a balanced tonic, you won't feel energy, but you won't feel relaxed either. It just brings you to that adaptogenic center point of homeostasis easier. Like a previous reviewer mentioned it gives sustaining anti-fatigue energy more than anything. Super concentrated jelly consistency. Another great product from TT. Long time fan, thanks!